Okay, so some things are missing from my blog right now... I bought a new server for home and installed Windows Home Server on it. So as it stands, I'm still getting used to things. I'm also in the process of transferring around 400GB of data back to the server, so it's taking a while. Once that's done I'm hoping to get the web server portion up and running again. The blog still works, there's just a few missing images. March 18, 2009 05:43 PM - A man and woman have been rushed to hospital with life-threatening injuries after the motorcycle they were riding collided this afternoon with an SUV at a busy Mississauga intersection. The female passenger on the motorcycle was rushed to Credit Valley Hospital with critical injuries and has since been transported to Sunnybrook Health Sciences Centre, where she continues to fight for her life tonight. The male motorcyclist was airlifted to Sunnybrook in Toronto with critical injuries. Emergency crews say he may need to amputate both legs as a result of the crash. Peel Regional Police responded to the Hurontario St./Eglinton Ave. scene just before 5 p.m. after numerous 9-1-1 calls from drivers reporting the crash between the Suzuki motorcycle and Honda CRV. The driver of the Honda was uninjured. The crash brought traffic to a halt, as police closed a large area surrounding the intersection. Lane closures are expected to last well into the evening. An officer on the scene said the traffic light change likely factored into the collision. March 19, 2009 12:20 PM - Police are looking into the possibility that a driver of an SUV may have illegally entered a busy Mississauga intersection late yesterday afternoon before crashing into a motorcycle, sending the driver and his passenger to hospital with life-threatening injuries. Peel Regional Police said today that the motorcyclist, 30, and his female passenger, 22, are expected to live following the rush-hour collision at Hurontario St. and Eglinton Ave.
motorcyclists. Police will also be at the rally. The motorcyclist was airlifted to Sunnybrook Health Sciences Centre in Toronto after his Suzuki collided with a Honda CRV at about 5 p.m.
Peel Cst. J.P. Valade said the man's condition has improved. He has serious leg and arm injuries, but is expected to survive. The passenger, who suffered internal injuries, was initially taken to Credit Valley Hospital. She was also transferred to Sunnybrook. She, too, is expected to live. The 62-year-old female driver of the SUV was not injured. Officers with the Major Collision Bureau are investigating whether the woman entered the intersection improperly, believing she had an advanced green light to make a left turn. They say "no witnesses to the collision remained at the scene, despite the dense traffic conditions at the time". Investigators are appealing for witnesses to the come forward. The accident brought traffic to a halt, as police closed off a large area surrounding the intersection. Lane closures lasted well into the night. That's two reports on the same accident. It's early in the season and we all need to be careful out there. As usual, no one is watching out for us. GTA Motorcycle.com (Toronto and Area Motorcycle Enthusiasts Online) organized a rally for that evening to bring awareness to the fact that we as motorcycle riders are out there and that there is no excuse for nothing less then 100% attention when driving. Peoples lives are at stake here. The following videos show the rally that was held. Be careful out there. Happy 1st day of spring to all my fellow two wheeled riders out there! Isn’t it nice to shed off that winter mind set! In celebration, I went out and bought some things to help me keep Selene clean. And last night (this morning actually, around 2am) I went over to the garage and changed up the final drive oil. That’s the second of three fluids that needed changing. The last, and most daunting, is the coolant. That might be a two man job as I have to remove the gas tank in order to get at the radiator cap. Things like this make it annoying to own a liquid cooled bike. 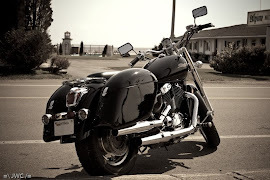 And really…do we need liquid cooled bikes in Canada? LOL. It’s 4C (39F) with high percentages of sand and water on the roads, but I got out for a ride today. Selene got a little dirty, but not quite as bad as I expected. I put on around 20km (12mi) or so, just far enough to take Joey to work, get me home and get my hands cold. The roads are in ridiculous shape. I didn’t realize how bad they were until I could actually look down and see them. Some places aren’t even pavement anymore. It’s so chewed up it may as well be dirt. It will be interesting to see if they actually have a budget to fix them after the horrible winter we’ve had. I can’t say I’ve ever had an issue with riding a motorcycle with a lot of dirt around. Hell, I learned how to ride my first street bike on the dirt back roads of my home town. You just have to keep your wits about you and not enter turns fast or on a steep angle. Selene took it all like a champ and it was nice to be able to completely dodge the pot holes littering the streets. One other thing I kept in mind was to increase my follow distance with cars. Not only did this have the benefit of keeping them from spraying me with dirty/salty water, but it also allowed me to watch for the pot holes obscured by the car. Keeping the distance to two/two and half car lengths seemed good for the amount of water on the roads. I have to say, it was great. Even with all the obstacles to avoid, it was a great little ride. It’s great to be back on two wheels. The weather here lately has been great. We are on a steady upward climb for temperatures and we haven't been hit with any wacky snow storms. One of the women in our riding club has already been out twice and is making us all jealous. But it won't be long before we are all on the road. I'd be out myself, but there are a few things holding me back. My maintenance isn't completely done. I've changed the oil and filter, but I still need to do a coolant flush and change the final drive oil. The last thing holding me in place is all the ice in our parking lot. We received a lot of snow this season and with a lot snow comes a lot of melting. Our temperatures are still around the freezing mark so every morning all the melted snow becomes shiny ice. I keep gauging the roads as I drive in to work to see where all the danger spots are going to be once I'm finally back on two wheels. I'm guessing early April before I can ride safely, but I'll definitely try for sooner. Until the first day of spring. I know that we won’t be able to actually get the bikes out for a ride, but at least it’s a milestone showing us that it really isn’t that much further until everything starts melting. On another note, daylight savings time begins on March 8th. I consider that to be another milestone. Even if we do lose that comfortable hour that we gained last year. Hang in the, fellow buried riders. We’ll be out of this soon!